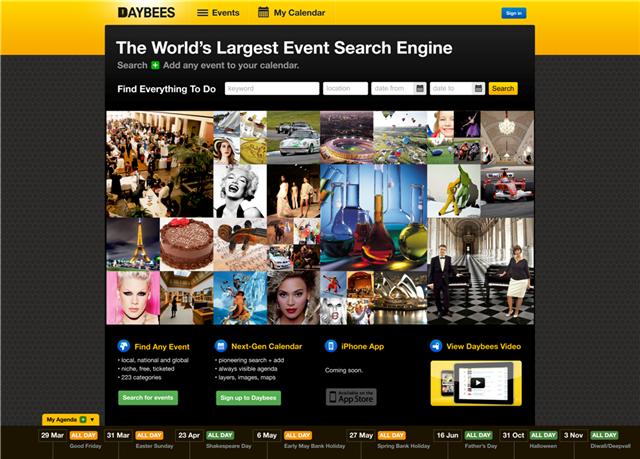 Finally a decent event search engine - "Daybees". This is called a vertical search engine and has over 230 categories with 1.5million events or happenings at any given time in its rolling database of future fixtures. It's a live beta launch and has already garnered interest from New York Times, Wired, and other online publications as it attempts to tap into the event-based search which seems to be the hardest one to achieve and maintain.